Tribes Overall: "This was an outstanding holiday experience which far exceeded our expectations(which were high having visited Tanzania before.)" Tribes Service: "We worked together to put an itinerary in place combining our requests with Tracy's knowledge of the area "
Guides: "The guides at Robin Pope and Shentons were excellent. 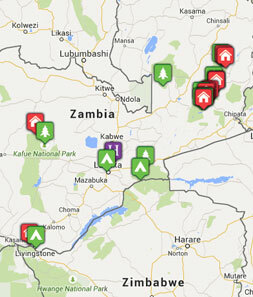 Zambia has very highly trained guides where all guides have to pass a difficult test and be registered." Social & Environmental Responsibility: "Both camps employed local staff. They both had training programmes for guides. At Shentons they help with the South Luangwa Education Project information of this was given to us before we arrived so we could take pens pencils and other equipment which they would pass on." Our favorite camp small with animals all around and the best hide on site overlooking a waterhole which a great variety of animals coming down to drink - Great photos and videos!!!!! Only over night stop over Lovely location will stay longer next time. Again lovely location on the bend of the river viewing wild life from our excellent accommodation or while eating our excellent and frequent meals. "Wildlife everywhere and so close - delightful Lions with cubs in the daytime and watching the Mwamba-Kaingo and Hollywood pride kill on the night drive. Also Leopards everywhere"
"Being in the mobile camp and the Mwamba bush camp right in the heart of the Bush with animals like elephants coming for lunch and some naughty young hyenas pinching the cushions and playing with them at night."